Atari ST / STE Game: F-16 Combat Pilot 1 days, 21h:03m:53s £8.00 Buy now! Atari ST / STE Game: F-16 Combat Pilot	 1 days, 21h:03m:53s	 £8.00 Buy now! Atari ST Game - WrestleMania by Ocean	 12 days, 21h:00m:51s	 £7.50 Buy now! 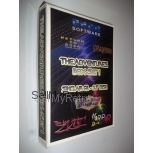 Atari ST Game - Fighter Bomber by Activision	 12 days, 21h:03m:54s	 £7.50 Buy now!